Visual Studio 2013 Tips & Tricks - How to Disable Browser Link in Visual Studio 2013 ? 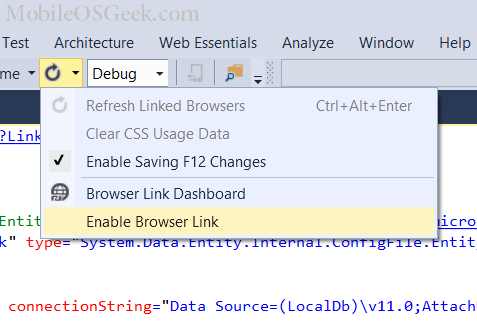 In one of my previous blog post , i demonstrated how to use the Browser Link feature in Visual Studio 2013 . The Browser Link feature is enabled by default . You can disable it in 3 different ways . 1. Setting the Debug attribute to false in the Web.config file. 2. Add a new key under appSettings with the key “vs:EnableBrowserLink” with the value false in Web.config file as shown below.